This human drama portrays the relationship of an elderly woman who formerly suffered from a form of leprosy (Kirin Kiki), the middle-aged owner of a dorayaki (red-bean paste filled pastries) shop (Masatoshi Nagase), and a junior high school student who frequents the shop (Kyara Uchida). 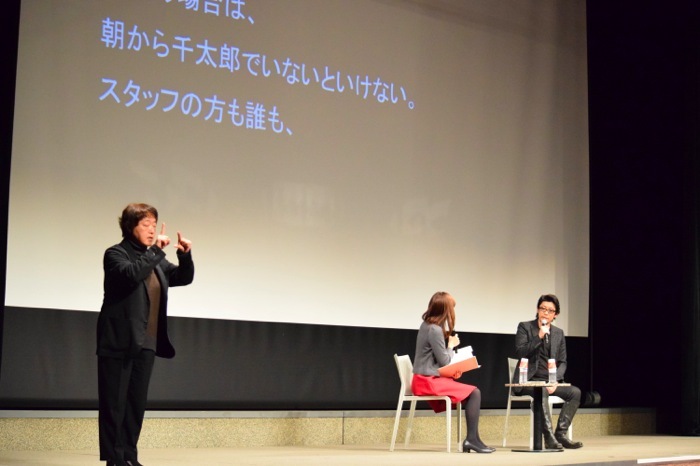 The story is based on a novel by the poet, author and musician Durian Sukegawa. 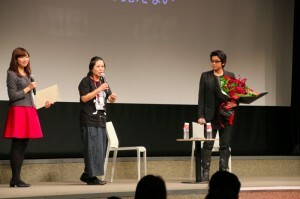 The director of the film, Naomi Kawase, garnered attention at the 2007 Cannes International Film Festival where her work “The Mourning Forest” received a Grand Prix award. 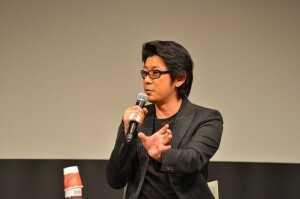 The art director of “An” was Kyoko Heya, the director of this film festival. 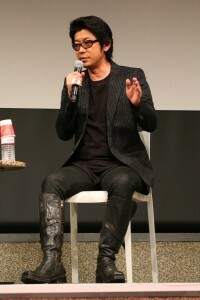 After the screening, the large standing-room only crowd burst into applause, followed by the dashing appearance on the stage of Masatoshi Nagase, who played the dorayaki shop owner. The screening was followed by a talk show that was hosted by Mai Oshige, an announcer from Hiroshima Home Television. 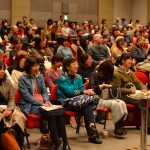 Mr. Nagase, who was visiting Hiroshima for the first time in 20 years, commented smilingly that, “I just arrived some 20 minutes ago and can’t really believe I am here.” The atmosphere in the hall was friendly and relaxed. Regarding Kyara Uchida, who is the actual granddaughter of Ms. Kiki and played the role of the junior high school student, Mr. Nagase commented, “In contrast to the three other junior high schoolers in the film, who act very cute and charged up, she plays a junior high student with a more dignified character. She is actually the same in real life and a real cute young lady.” The young actress showed her dedication to the craft in coming all the way from her current home in London to Japan for the filming.